Environmental sustainability is at the heart of our business practices and is the core of our values and beliefs. Our apartments are based around a holistic approach to design and as such we are Canberra’s first 8.0 EER energy rating multi-unit development. Our passion for the past and respect for the future, helps to drive the material and décor choices. We enjoy consuming less, recycling and conserving resources and our accommodation reflects this. Our environmental mission is to help preserve our local environment by adopting sustainable business practices into our everyday operations. We strive to minimise waste, conserve natural resources and partner with local, environmentally friendly businesses. To reduce, reuse and recycle. To purchase environmentally friendly products. To conserve energy, water and natural resources. We recycle all paper and bottles and cans and compost all food and landscape waste in an onsite compost. Our gardens are xeriscape, meaning they are native and low water plants. This also provides habitat for native birds and wildlife. We provide herb gardens, a green house and a veggie patch for guests to help themselves to seasonal produce. All of our lighting is LED or CFL. We buy Energy Star-rated appliances, electronics and office equipment. We use water efficient toilets, shower heads and faucets. We promote the use of public transportation by our employees and guests. We provide recycled bicycles, helmets and bike locks for our guests to use as an alternate mode of transportation. All of the apartments are in excess of EER 8.0 by virtue of the materials used, their heavily insulated structure and the double glazing. We conduct our business electronically as a preference to paper. We use less nontoxic cleaning products. 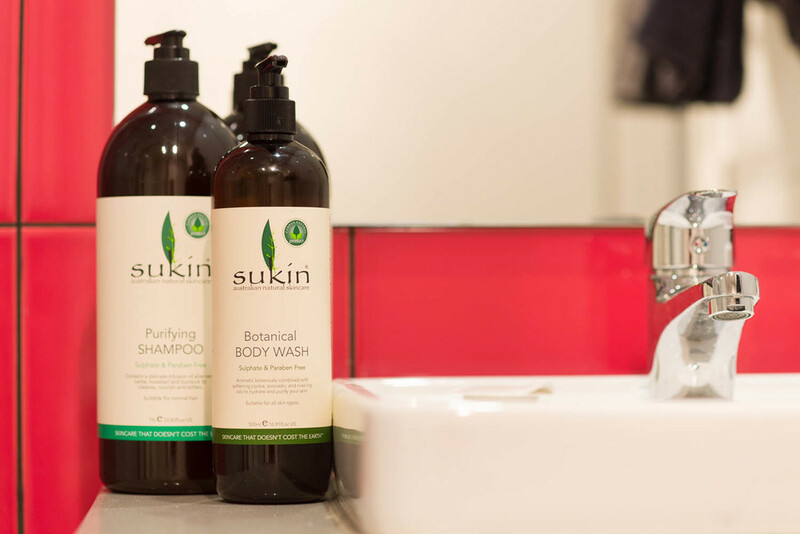 We provide large bottles of Sukin Australia toiletries, to minimise on waste. We provide organic, fair-trade coffee. We love to support causes and organisations that are doing something special and making a real difference. We are partnered with Abundant Water, a Canberra-based, ‘not-for-profit’ humanitarian development organisation empowering remote Lao communities by training potters in the clay-pot water filter technology. As part of this partnership we ask guests to donate $2 per booking upon checkout. 100% of the funds raised goes directly to Abundant Water’s efforts.